Baird consistently receives top scores from small-cap and mid-cap fund managers relative to our bulge-bracket and middle-market competitors. *This category was introduced in 2017. Greenwich Associates North American Equity Investors – U.S. Small-/Mid-Cap Funds and U.S. Equities Sales, Corporate Access & Research, May 2018. Surveys conducted with 110 small-cap and mid-cap fund managers and 194 fund managers and 275 traders, respectively. 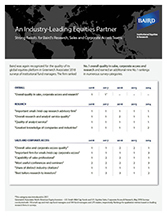 Rankings for qualitative metrics based on leading research firms in surveys.